Even if you have the address it can be difficult due to Venice’s somewhat Byzantine way of numbering the houses. Numbers seem to change without logic. And look for number 1 in most streets and you’re not going to find it. Actually however, unlike many things in Venice, the system is not Byzantine at all but Austrian. During the time of the Venetian Republic the streets and houses had no official names or numbers at all. People would say, ‘I live in the street where the fruit shop is in the parish of San Vio.’ Or, ‘His shop’s in the wide street in the parish of Santa Maria Formosa.’ The only fixed marks were the parish (or contrada) boundaries and the six sestieri (districts). For those that lived in and knew the city, this information was enough. The Treaty of Campo Formio in 1797 brought an end to the Republic and the beginning of Austrian Rule. The new administrators decided to try and make sense of the city by adopting official street names. They decided to write them on the street corners, creating the characteristic street signs or nizioleti which can still be seen today. In order to do this, they asked local residents what the street was known as. For this reason, the nizioleti are written in Venetian dialect rather than Italian. If they had been done before the Austrian invasion they would have been written in Italian, which had been adopted as the written language of the Republic since the 1500s as the many pre-1797 inscriptions around the city attest. On 24 September 1801, the Austrians passed a new law outlining a system for the numbering of houses. The numbers were to be stencilled in black on a white background on each building. Later, they changed to colour of the numbers to red. For the most part, this is the system which you can still see today. For each sestiere, a starting point was chosen. The buildings were then numbered snaking out from that point. For example, in the Sestiere of San Marco, the Doge’s Palace was chosen as the starting point. This is how it came to be numbered San Marco 1. For the other sestieri the starting points were: Canareggio, the church of Santa Lucia (now demolished and the site occupied by the train station); Dorsoduro, the Basilica of Santa Maria della Salute; Santa Croce, the ponte San Pantalon; San Polo, the Palazzo dei Camerlenghi next to the Rialto Bridge; and Castello, the Basilica of San Pietro di Castello. The number of houses in each sestiere varies but, for example, in Santa Croce there are 2559 house numbers. This is attested on a bridge where a nizioleto announces the last building in the sestiere. There is a similar nizioleto near the Fontego dei Tedeschi announcing the last building in the sestiere di San Marco which is number 5562. Today, official addresses are given by the name of the sestiere and the number, so, for example, Castello 455. 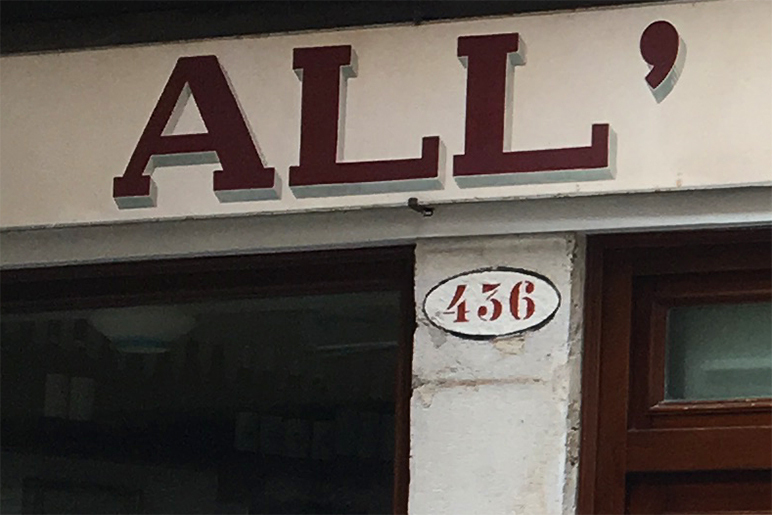 However, to help people other than the postman to find the locations people often add the name of the street as well, for example, Castello, Fondamenta San Gioachin 455. If you zoom in on this map you can see the venetian house numbers overlaid on the streets. If you’re looking for an address, it’s a good place to start. In some places, you’ll see house numbers chiselled into the stone of the door frame. They are Roman numerals, and have no similarity to the current numbers. I wonder when they were done, and why they were only used in a few areas? You normally find those in areas where, during the Republic, there were house for rent. They were basically rental apartment numbers. For example, you see them in Borgoloco San Lorenzo. ‘Borgoloco’ basically means ‘street with house for rent’. Aha! There were many in Castello, where accommodations were built for Mariners. Yes! They tend to be in distinct areas. The Venetians liked to have everything compartmentalised in the city. Now that is one crazy system! Worth another post, methinks.